C.D. Henry was more than the name on an iconic building at Grambling State University. Dr. Charles D. Henry’s tenure as chairman of Grambling State University’s College of Health, Physical Education and Recreation was one of innovation. 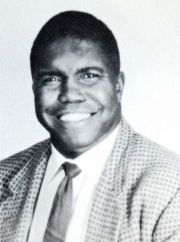 It included collaborations with  some of the university’s most legendary coaches and student athletes, including the well-known Fredrick Hobdy and Eddie G. Robinson Sr.
Dr. Henry led the College from 1958 to 1974 and also serving as executive officer and secretary-statistician for the Southwestern Athletic Conference from 1968-73. A native of Conway, Ark., Dr. Henry graduated from Philander Smith College in Little Rock where he became a member of Omega Psi Phi Fraternity, Inc. He went on to receive his master’s degree and doctorate from the University of Iowa. He began his career in athletic administration at his alma mater as the director of athletics and assistant football coach at Philander Smith, serving for six years before coming to Grambling. Under his leadership, Grambling State grew in both athletics and community achievements including hosting the NYSP (National Youth Sports Program), winning the University’s first SWAC Conference Basketball Championship, and the completion and renovations of the Natatorium (formerly known as the Physical Education Annex) that would be later dedicated to Dr. Henry in 1985. Dr. Henry’s Grambling State achievements and service fueled his progress to creating a national impact in student athletics. In 1974,  he left Grambling to join the Big Ten Conference, becoming the nation’s first African-American assistant commissioner for any athletic conference. Throughout his career at the Big Ten, Henry displayed the same zeal as the staff liaison for women’s intercollegiate athletics as he did for assisting in African-American national issues. He was instrumental in preparing the Big Ten for officially instituting women’s competition in 1981-82. He served as an advocate for historically black colleges and universities on a national level which included serving as the executive secretary for the National Athletic Steering Committee, the athletic policy-making board for all HBCUs. On Dec. 14, 1982, Henry passed away at the age of 59 after a brief illness. Since his passing, he continues to be recognized nationally by the institutions he served. The Big Ten created an internship in his name, which provides training for minorities interested in pursuing a career in intercollegiate athletics. The Society of Health and Physical Educators established the Charles D. Henry Award in 1984 to recognize contributions of its members to increase the involvement of ethnic minorities in the organization. The SWAC honors its highest-achieving men’s athletic program each year with the C.D. Henry Award. In addition, at Grambling State University, the school’s natatorium bore his name during its final 23 years of operation. This entry was posted in gramstory on June 10, 2018 by Jovan Hackley.